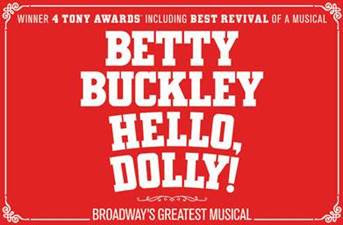 Producer Scott Rudin and Broadway In Chicago are delighted to announce the cast for the first national tour of the Tony Award-winning Best Musical Revival of HELLO, DOLLY! starring Broadway legend, Tony Award winner Betty Buckley. The first national tour of HELLO, DOLLY! will play Broadway In Chicago's historic Oriental Theatre (24 W. Randolph) for a limited four-week engagement October 23 through November 17, 2018. Individual tickets for HELLO, DOLLY! at the Oriental Theatre (24 W. Randolph) go on sale tomorrow and range from $27-$98 with a select number of premium seats available. Tickets are available now for groups of 10 or more by calling Broadway In Chicago Group Sales at (312) 977-1710. Tickets are available at all Broadway In Chicago Box Offices (24 W. Randolph St., 151 W. Randolph St., 18 W. Monroe St. and 175 E. Chestnut), the Broadway In Chicago Ticket Line at (800) 775-2000 and online at www.BroadwayInChicago.com. Broadway In Chicago was created in July 2000 and over the past 18 years has grown to be one of the largest commercial touring homes in the country. A Nederlander Presentation, Broadway In Chicago lights up the Chicago Theater District entertaining over 1.7 million people annually in five theatres. Broadway In Chicago presents a full range of entertainment, including musicals and plays, on the stages of five of the finest theatres in Chicago's Loop including the Cadillac Palace Theatre, CIBC Theatre, Oriental Theatre, and just off the Magnificent Mile, the Broadway Playhouse at Water Tower Place and presenting Broadway shows at The Auditorium Theatre of Roosevelt University. For more information, visit www.BroadwayInChicago.com.